Sam Devol :: WordPress Troubleshooting: My blog looks horrible in IE! This is the latest extension for Firefox and Flock. You can get this from tones blog here. You see the meebo on the sidebar so your friends won't complain anymore that you don't notice new text coming through. I first heard about BlogSolution then it's WordPress Elite. What they do is let you easily, it should be very easily, manage hundreds or thousands of blog from one interface. What's the goal? Just to fool search engines to increase your Google pagerank or get more $$$ from clicks. This is also called splot or SPAM blog, what a waste of traffic. Just installed SK2, said to be the best plugin to kill spams. There are lots of setting within the admin and I don't bother going through them yet so all of them are with "factory setting" at the moment. Gliffy is Visio in your browser. It does flowchart, floorplan, diagram, layout drawing and even web page design in your browser. Your work can be shared and collaborated with others. It will be a paid service in due course. Very soon I believe there will be CAD drawing service delivered online as well. With a little tweak may be Gliffy can compete with ZohoShow. Ads are now moved to end of each post. This serves also as a separator between posts. Reference in Codex is here. It must be a restriction by Adsense as there are only 3 appearences of ads. Just tried another one Chrysanth WebStory which is dearer at $39.95. WebStory is a much bigger programme and it maintains a database on your desktop (you decide how many posts you want to download). The thing I don't like for both of them is that html codes for fonts are added by default which mess up the codes a lot. I think performancing for Firefox is still the best. I wonder how many bloggers out there are using these desktop tools that aren't free! This is the new Yahoo photo uploading interface. At the moment it's not comparable to flickr yet as it's slow and lack of hot linking ability for blogs. The HELP section is basically empty! TechCrunch also wrote about them here. ZDNet's blog post on Web 2.0 Explorer used a title of "Zoho releases Ajax presentation app - last piece of Web Office jigsaw?" The entire Zoho suite (this new one is Zohoshow) is aiming at the right direction but what they are offering so far isn't really complete unless a complete paperless office solution is available. Another likely scenario is that by 22nd century rain forests are so scarce that paper production has been banned. Actually the web application I would like to build (without knowing all the backend "how to") is a repeat of my dream "paperless office". Essentially it is a database of holding paper copies either online or on intranet but everyone has his/her (every team/company/corporation) own way of life and an unique way of tracing historical paper copies. It's still a misery as to what algorithm we have in our mind to trace memories. Image that you have a very messy work desk at work but you can always find a piece of paper hidden for your boss and you don't really want someone to organise (tidy up) the desk for you. Now you want to remove that physical messy desk and put it online. Currently e-document management system, be it free or paid for, are rigid system. They all say this "....our system is the best, follow me I'll show you how ....". The hidden facts are "...if you don't follow the way we have written the backend logic it'll break and we can't guarantee that you'll never find your stuff again....". They have 2 products for small office namely eDocXL(office) and eDocPlus (home). There is also a line for Corporate. For a small team of 15+ users you really have to use eDoxXL CS which is at Euro 1,199.00 It's not really that expensive starting from Euro 49.90 if you want one for home use. You can also download a trial version. Today has been boring. I had to go through all my statements, 3 of them with hundred of pages, and prepare a list of relevant correspondence to go into the hearing bundle index. We have to provide these relevant correspondence to our QC and junior counsel in the UK and they came back and said "...we want hardcopy for reading...". Can you imagine that in 21st century there are still people who still don't know how to look up a file by its name and click it open to read from the computer screen? I didn't care and have sent them 4 CDs of relevant files. This Picasa Web Albums is completely useless. You have 250Mb for free and a paid subscription has only 6G! It's a long way to catch up Flickr what the hell Google is doing. It appears that Google simply don't look after those companies that they acquired. Picasa is one and Blogger is another, what a shame! There was a minor issue with this theme. The sidebar shows differently on firefox in my PC at home from that in my PC at the office. Both firefox installations are of same version and both are running on XP Pro. However on IE6 it is also showing the wrong way which is that there is a little gap between each expandable group on the sidebar. I think I have cured that issue by minor changes on the padding of that class for sidebar group. Now both IE6 and firefox on different PC are showing the same, i.e. there should be no gap between each group on the sidebar. From their site this looks like a desktop application. What if I need a network solution for a team of people? I'm still surprised that nobody is building web application to fill this little gap in "Office 2.0" ! I brought a domain name back in February this year thinking that I could write about paperless office. This site is still here Too bad I didn't have the time. I wrote mainly witness statements in the first 6 months. There are just few posts about paperless office which have now been moved here. Apart from those other posts were about tweaking of a few themes that I have tried over there. I have now created a subdomain for my sister in Malaysia, her site is called The Life Of An Alien. Sister said she'll write about her work as volunteer helping people. I'll stop writing at office.papierlos.net but am sure I will find good use of it helping others. The article is still there at ASP101 - The Place ASP Developers Go! When exactly I submitted that, I can't recall but I'll find out just for record sake. Being a member of the engineering community I personally have not seen too many changes affecting the way we conduct our business. OK, you may say we can tender using electronic delivery but I doubted any contractor has done it, especially for large contract which required voluminous submission. During performance there is nothing specified in trying to utilize the IT investment the SAR has put in (total of $3,868 million according to the survey just for 2000-2002). The mindset has not been changed over the years. I once worked in consulting practice, my ex-colleagues told me recently that submission of study report is still specified to be in paper (at least 25-30 copies) to various departments. What's wrong with CDRom? The attached article described a personnel experience, my low cost attempt. I was writing under the same title, for a ASP programmer website, something similar of much longer length (with code snapshots, screen capture etc), hence trimming down to about 1,500 words was easy. The public consultation ends in December. Let me know if you would consider publishing this one. They do paperless system, I just downloaded and watached their 5 minutes flash demo. Sorry I didn't finish it, got bored with it. I really don't understand why people like to make things so complicated. If I couldn't grab the key advantages within 3 minutes I naturally consider that product no good. We are all flooded with too much information and with very little time understanding things. I think paperless system should be simple and user friendly. Big software developers are following wrong path paved by big guys like Microsoft. That sort of model, i.e. embrace all features by your competitors and deliver more and better, is out in 21st century. Good applications should be simple to use, easy to set up, open source allowing customization by the users to suit particular application environment and requiring no special skills other than an junior programmer. Come across the new service by fluxiom. They used a fancy name of "digital assets" management. In essence they manage your files in their server such that you could share them with your team, tag them for easy retrieval and preview them. This is getting close to my idea of paperless office, i.e. you could put all your digitized document on the web and view/download/share them via internet. I read about this at Solution Watch. Apparently TechCrunch also featured this here. If you want to see a full list of online-storage services now available go to see this post here. 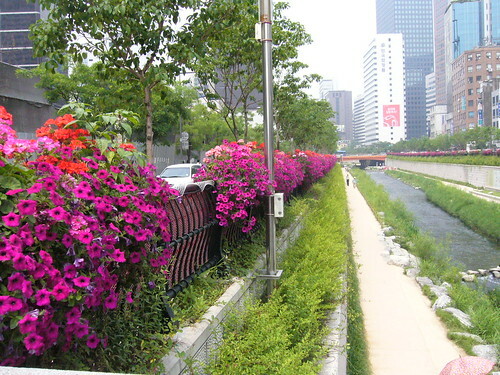 This is the river Hangang that runs through Seoul. I was told what you see below is the upstream end which has been beatified. It was a sunny day and the flowers look very nice. 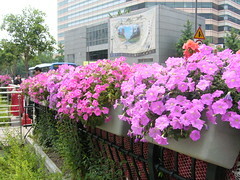 This is city hall area of Seoul Korea near the famous Myungdong shopping district. 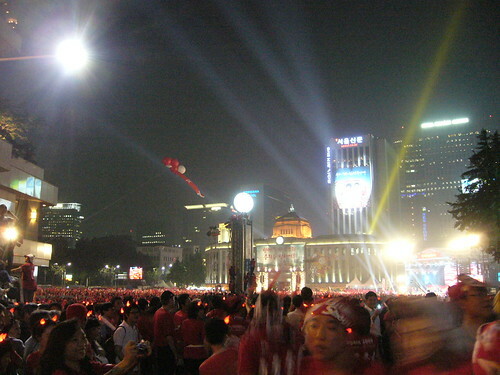 I was there for the first match of Korea World Cup. Have never experienced such noise and energy before and hundreds of thousands of people roaring for their team. We didn't stay long because we worried that it could be difficult to get out from the crowd if they didn't win. you weren't here, you never saw me. I put down my experience on WordPress themes below since I moved to WordPress last September. From below I can now recall that I switched theme frequently at early months. That was due to the fact that I had little skill in customizing themes and I find better and nicer looking themes everyday. Later I learnt more about customizing and codes behind the theme which helped me to better fitting the themes to suit my taste. May be I didn't know what actually I was looking for by then. The theme Thirteen from Beccary must be the very first theme I used. I was using DreamHost at that time. Have done further work on this theme. The sidebar looks like a single plate now of one color (doesn't look exactly the same in IE6, too bad). Mouse over that you'll see highlight of each group for your clicking to open. It looks a bit dark, but well, I just like blue. I'll find time to work on a green color scheme. 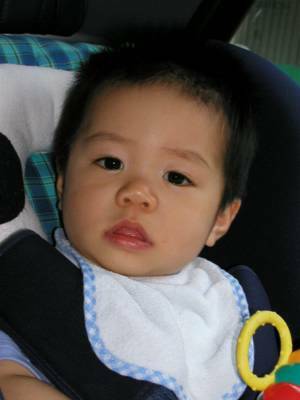 Activated LesterChan's WP-PostViews and Gnot's Simple Recent Comments Plugin here. Check the sidebar group for these to have a look. I have just registered to try the Yahoo Photos beta. It'll take them 10 business day to get it thru' for me. There are screenshots here in TechCrunch. It's said to be better than Flickr and mostly free. What am I going to do with my 3,000+ photos with Flickr and my pro account? It was less than 8 hours ago when I signed up for my Google spreadsheet, I got my access to it at around 11:30pm. Here below is my first test drive. Like other Google products their spreadsheet is clean, simple, responsive and you don't feel any need for refreshing of the page at all. If fact you don't have to signup for one. 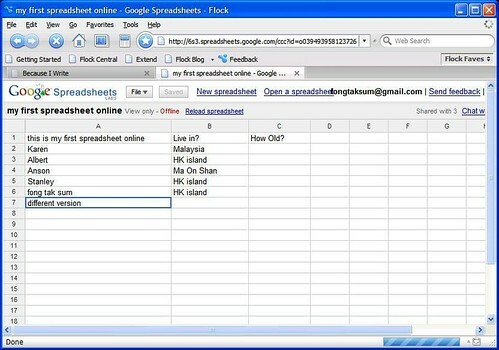 I have created a spreadsheet and sent invitation to my brothers and sisters including myself at another gmail account. Click the link from the email invite then you'll be granted access to your own storage space at Google spreadsheet homepage here. The people whom you've invited cannot in turn invite others to view or edit the spreadsheet. They cannot remove you from it. The original file will continue to live on your Google Spreadsheets storage space. In fact there is a workaround. The editor you have invited can in fact save that file you own as another file name without your permission. Once that file has an new identity then that editor you once trusted can share that file with others without your consent. This is a security threat I think therefore THINK BEFORE YOU SHARE. Google should improve this by removing the "save as" right of the editors. Chat is enabled once your sheet is shared and you know instantly if collaborators are online. There are lots of formulas available now. 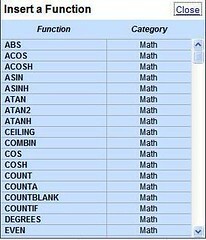 There are grouped by categories such as info, text, statistical, lookup, date, logical, financial and math. There will be catching up to do by other products (e.g. iRows, Tracker, ZohoSheet, EditGrid or Dabble DB) in the market. I think this is a really good collaboration tool having synergy with Gmail and GTalk. How good it is when the file is getting large, full of formulas and a few people online punching instantanously this is yet to be tested. Google is really stepping in Microsoft territory. If you keen to test drive it, fill in your email address HERE. Take an early peek HERE. I have stopped using other desktop IM client for a long time. Tell others that you use meebo as well by grabbing button from here, see mine at the sidebar. Have just done a SiteScore test. My last test is here in this post but that was done for another domain name before I moved over to here. I don't care about score but it's good to know how the system works. This site is ranked 1,449,700 in the world which they considered reasonable. I was 5,066,854 back in January 2006. They used 40 links as a minimum benchmark to ensure it is listed effectively by Google and other major search engines, I got 39. Well they say they can help you with free listing. I have redirection script from the root domain name which they also said is bad. Work on this theme is more or less complete. With the nice collapsable sidebar scripts I have added few groups showing links and static pages. The sidebar is still of reasonable length because only 1 group is open at any one time. I don't know how many themes I have used since I moved to WordPress last September I hope to keep this one longer. The only thing I would probably do is add a header image or do a few other color schemes when I have the time.